Your favorite feline's endless appetite for naps will be sated by this comfy, handmade wool cat bed. 1) Cats sleep ⅔ of their lives, twice as much as humans do. 2) The word "catnap" exists. 3) Everyone loves funny, cute pet stuff. 4) Tacocat spelled backwards is "tacocat." 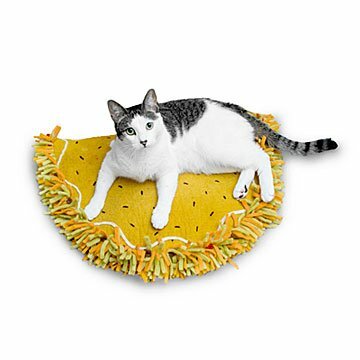 Ergo: This taco cat bed was inevitable. Handmade, like most tacos—in Kyrgzstan, unlike any tacos we've ever heard of. Ingredients: 100% wool from local sheep. Chef: Gulnara Kydyrmyshova. When Kyrgyzstan became an independent country in 1991, most of the nation's talented artists fled to larger and more creative cities. But maker Gulnara Kydyrmyshova stayed behind and established a small retail store with the vision to revive Kyrgyz craftsmanship and help relieve her nation of poverty through the trade of handmade felted works. She started by conducting free sewing classes to unemployed women in her community. For over a decade, she has supported local artisans by selling felted handicrafts in her store. Read more about about Gulnara's work (and see some stunning photos of Kyrgyzstan) on our blog. Cats are so unpredictable so who knew my fur baby would love this item the minute we unwrapped it! We kid around that everyday is taco day for our cat not just Tuesdays! This cat bed is excellent! My cat chews things, including toys, but he has not tried to chew this and nothing looks loose or like he might chew it off. It is cute and funny.